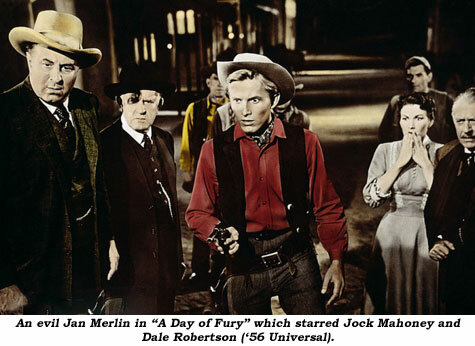 Jan Merlin brought nasty, grinning, near psychotic cads to perfection in films and TV throughout the ‘50s. 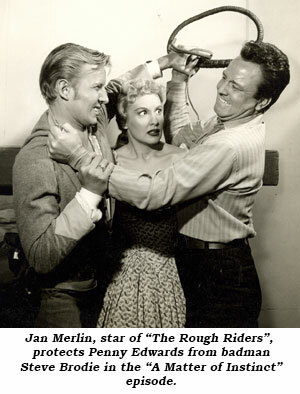 Jan more or less bookended these contemptible roles by playing good guys—first as Cadet Roger Manning in “Tom Corbett, Space Cadet” starting in 1950 and then in ‘58-‘59 as Lt. Colin Kirby on ABC’s “Rough Riders”, co-starring Kent Taylor and Peter Whitney. Jan was born April 3, 1925, on the lower east side of New York City where his parents were caretakers of a Russian Orthodox Church on East 4th Street. Jan’s father was Peter Wasylewski, a Russian who came to America in 1912. His mother was Theresa Gusiakowna, an Austrian Polish lady who arrived here in 1913. They met and were married in 1914. At age 10, when his father died, Jan entered Grace Church School for boys, a choir school where he sang in the choir until his voice changed at 15, which is how he paid to attend a private school. Enlisting in the Navy in 1942 after WWII broke out, Jan served on destroyers as a torpedo man, spending most of his time in the South Pacific. They fought battles from Wake Island, New Guinea, Tarawa, up through the Gilbert and Marshal Islands and Okinawa. Leaving the Navy after the war in 1946 without a trade to follow, a chance meeting with the owner of a summer theatre in Fishkill, New York, found Jan putting his artistic talents to work designing and building sets. 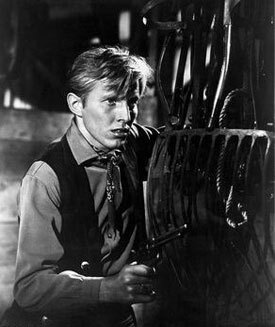 Believing he could do what he was seeing the actors do, Jan enrolled a year later in the Neighborhood Playhouse School of the Theatre and studied under the renowned Sanford Miesner. Frank Butler, the actor who told him of the famous school, also suggested he change his Slavic name to Jan Merlin. After being taught how to speak, dance, and the rudiments of acting, Jan returned to summer stock as an actor in Fishkill, doing as many plays as he could. He then returned for a second semester at the Neighborhood Playhouse and another season of summer stock. Down to his last nickel when the season was over, and wondering how he’d make a living, Jan answered a cattle call casting for Josh Logan’s “South Pacific”. Interviewed by Logan, he was told one of the boys was leaving the big hit “Mr. Roberts” and which play would he rather be in? Stunned, Jan chose “Mr. Roberts” because, as he told Logan, “I can’t sing.” He stayed with the Broadway play for two years. About the end of the second year, they were casting for TV’s “Tom Corbett, Space Cadet”. Jan’s cocky, self-assured attitude won him the role of sassy Roger Manning. Feeling typed with the same character, Jan left after three and a half years, spending time in Africa, a county he’s always studied and loved ever since he read TARZAN OF THE APES as a child. When he returned to the states, he also returned to “Corbett” for six months, then did several off-Broadway shows including “Rope”. During the run of “Rope”, he was contacted by Universal and cast in “Six Bridges to Cross” (‘55). Jan worked non-stop in film and TV for 41 years, doing two plays in Hollywood as well, with his last role on a TV movie shown in 1992. One of his most interesting, yet torturesome, film roles was being made-up for and wearing all the mask disguises for cast members of “The List of Adrian Messenger” in ‘63, for which he received no screen credit. Now, Jan has written a fictionalized account about his painstaking experiences making the film, SHOOTING MONTEZUMA published in 2001. Jan first became a novelist in ‘82 with BROCADE, a war novel recently republished by Xlibris as AINOKO. Off of that, an old friend who was now head writer on the “Another World” soap opera persuaded Jan to join his group of writers. Jan worked for that series for about five years, earning an Emmy in ‘75 and an Emmy nomination in ‘79. Jan was first married to actress Patricia Ann Datz in 1951. His son Peter, now co-founder and co-owner of Aerospace Archeology Field Research Team, commonly known as an “X-Hunter”, was born in 1964. Jan’s wife Pat died of cancer in 1986.